Ongoing droughts and municipal water issues in the U.S have recently brought home the undeniable reality that, as an essential life resource, our water supply is not only limited but in need of protecting. The good news: we can do something about it. Today more than ever, companies and individuals are in the unique position of taking the lead on water conservation and making change happen. Our contributions, no matter how small, have an impact. If we simply remember to turn off the water when we brush our teeth, we are helping. If we plant native, drought-resistant gardens, we are making a difference. And if we trade in inefficient bathroom products -- toilets using 1.6 or more gallons of water and showerheads using 2.5 gallons per minute, we’re really having an impact. It truly is up to us to make a difference. And thanks to human ingenuity – that beautiful thing – comfort and conserving water are not mutually exclusive. Design continues to move forward in smart, efficient ways, so we don’t have to choose between stunning style, great performance and doing our part. Here’s how you can make small changes in your bathroom to save water and make a design splash. Believe it or not toilets are the biggest offenders in the home when it comes to wasting water. Chances are if you haven’t upgraded your toilet in the past 10 years it’s less efficient than it should be. To give you a sense of the current state of affairs: in California alone, the state with the most advanced guidelines, only 5.5% of toilets are high-efficiency using 1.28 gallons per flush (gpf) or less. So, if you’re unsure whether or not your toilet wastes water, it probably does. 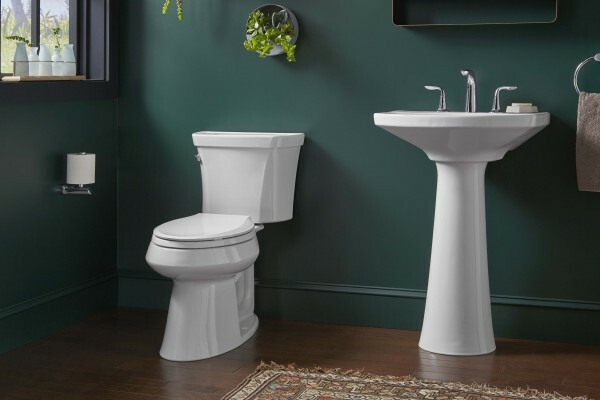 It makes sense then to swap your toilet for a high-efficiency toilet that can save up to 16,500 gallons of water each year, reducing water use by up to 20% over a 1.6-gallon toilet. Here are some things to note if you're considering a trade. Look to swap older 1.6- to 3.5-gpf toilets for water-saving toilets with a 1.28-gpf or less. Watch a quick video to discover the number of gallons your toilet uses. Choose between a single-flush toilet (what most of us have) and a dual-flush toilet that lets you choose between a half or full flush. Don’t limit yourself to white - choose from water-saving toilets in a wide variety of colors. Coordinate the design of your toilet with the look of your room, from classic to contemporary lines and details. For more details, tips and options, visit our Toilet Buying Guide. At first glance, tinkering with a shower you’re happy with seems kind of crazy. Unless…the new shower will be even better, for you and the world. Showering technology has evolved over the past few years to make it possible to combine an incredible spray experience, even music, with saving water. In fact, today, whether you opt for a single-function showerhead with great rinsing power or a multifunction showerhead that adds massaging and restoring sprays, you can go from a 2.5 gallon-per-minute (gpm) showerhead to a 2.0-gpm or less and save up to 40% more water. Some extra reasons to make the change. Swapping your showerhead or handshower out couldn’t be easier, unscrew the old model and screw on the new. 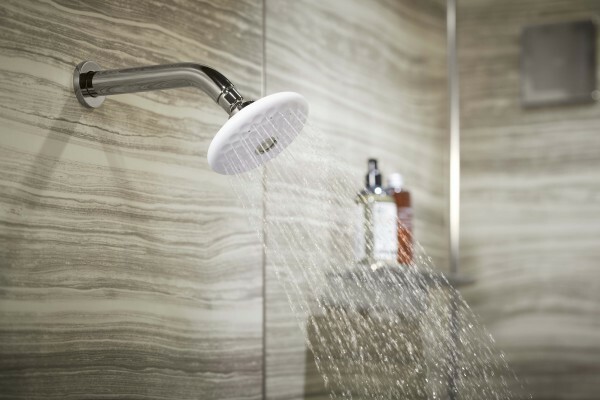 Explore rockin’ upgrades, like a water-saving showerhead that features a wireless speaker. Take it to the next level with a digital system that allows you to preset the duration of your shower to save water. Browse all water saving showerheads to find the one that's right for you. Certainly it makes sense to change out your faucet when it’s leaking, but upgrading to a new faucet can save a significant amount of water each year, up to 30% over a 2.2-gpm faucet. Plus, choosing a new style or finish can give your bathroom a new look. Why it makes sense to switch. Say goodbye to your leaky faucet or your standard 2.2-gpm faucet and install a 1.5-gpm. Match your faucet design with your bathroom style, from traditional to modern, or choose a contrasting faucet design to make a statement. Think about how the finish you select – like Rose Gold or Matte Black – can warm up or cool down the look of the room. Browse all water-saving bathroom faucets to find one that's right for you. With a greater emphasis on water conservation in the home over the last decade, it’s now easier than ever to find information on how to save water. A number of federal and municipal incentives exist to encourage water saving as well. Some information to round out the bigger picture. Look for the Environmental Protection Agency’s WaterSense label on the package. This signals a water-saving product. Be aware that individual states may have different water regulations. One of the most progressive states is California, and the CEC (California Energy Commission) regulates the state’s water policy and planning. If you’re interested in creating the most sustainable home you can, check out LEED (Leadership in Energy and Environmental Design), which offers third-party verification for green building. Some municipalities and states offer rebates for installing water-efficient products. You can start by checking your city’s waterworks or sanitation department website for details. Find rebates in your area. So, here we are with smart, beautifully designed options that invite us to upgrade our experiences along with water efficiency. All the more reason to do our part today.